Yes, now I have two blogs. This new blog is my manifestation of my thoughts and words which just been wandering in my mind, which is irrelevant if I put it in this blog. 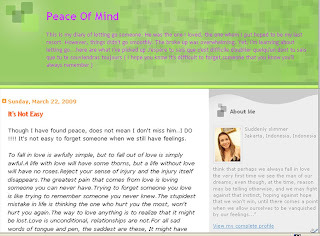 It is my diary in reaching peace of mind, a journey of letting go and everything about it.